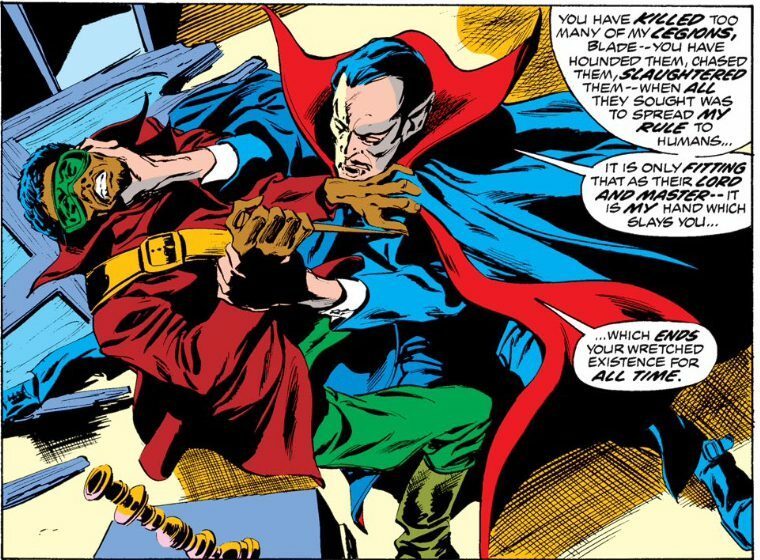 In 1973, just a few months at the helm, Marv Wolfman was already shaking things up at Marvel Comics’ “Tomb of Dracula.” He had introduced Blade, arguably one of the most important characters in the Marvel Universe, in TOD No. 10. Of course, we only know that in hindsight. But Wolfman wanted readers to know the horror title would live up to its grim potential. This wasn’t going to be the typical Marvel book in which the characters get pummeled one issue and are fine the next. Violence would have consequences. Some bad things were going to happen. And no one was safe. 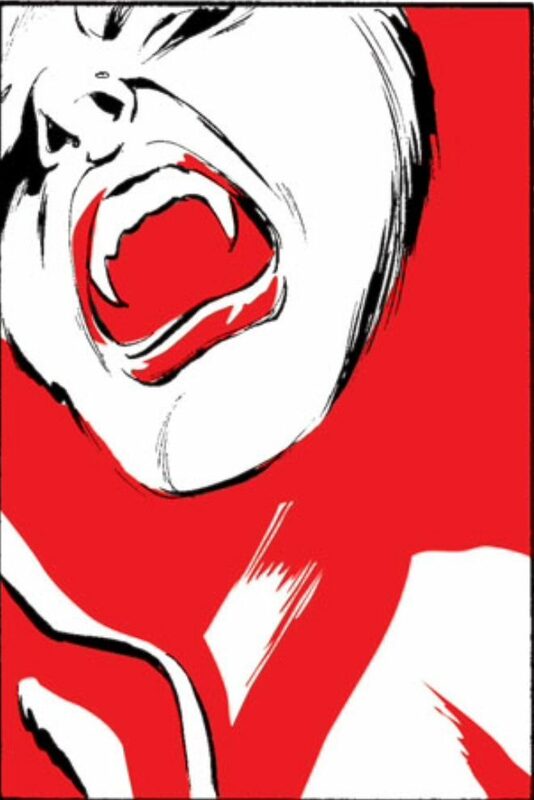 In “Tomb of Dracula” No. 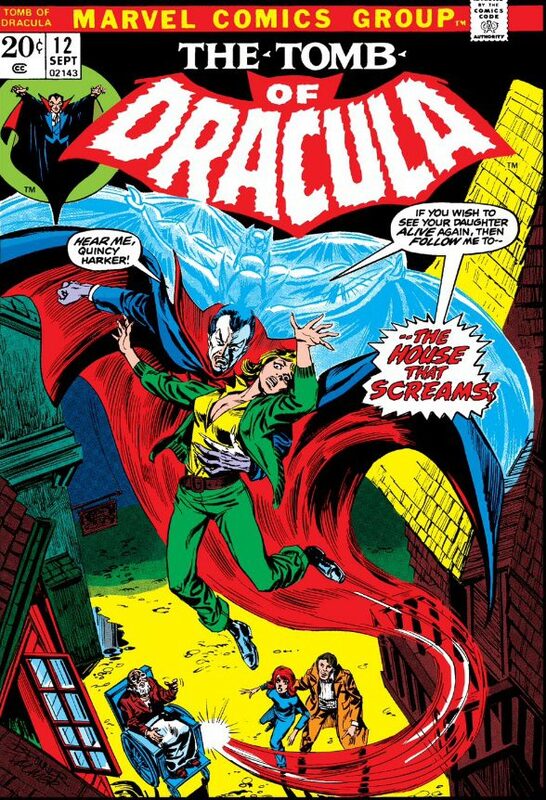 12, “Night of the Screaming House,” cover date September 1973, our intrepid band of vampire slayers prevent Drac from making off with yet another juice box that walks like a woman. 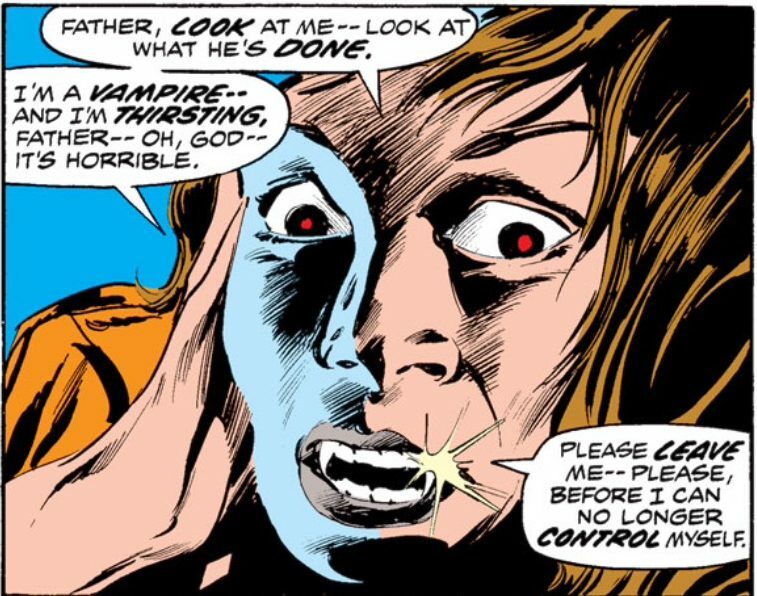 But it almost seems as if Drac was counting on his snack being interrupted. This bloodsucker has a plan. Dracula claims a pawn to win the war. He snatches Quincy Harker’s daughter, Edith. If Harker wants to see his daughter alive, he will meet him the next night at the destination of his choosing and there, they will settle their blood feud once and for all. Now a few words about Edith: She’s young, attractive, nice and pretty much the support system for the slayers. She’s not the warrior Rachel Van Helsing is. Yes, she came to the rescue of this madcap band in TOD No. 7, in a helicopter no less, when they were being terrorized by a mob of murderous moppets. But she’s more of the supernatural health home care aide for her crippled daddy and his vendetta against the thirsty undead. What choice do Harker and the others have? Dracula sends word: Meet him at the castle known as Whispering Hell. Blade and Dracula tangle yet again. Whispering Hell, Screaming House – man, the real estate in this neighborhood probably goes for a song, if you don’t mind adding a few exorcisms to your home renovations. And Vlad has decided to make it a party – he summons Blade, too. He’ll wipe out all his enemies in one fell swoop. This could be the deadliest party since the Donners. At the mansion, Harker, Frank, Rachel, Taj and Blade face all sorts of nasty surprises, including a swarm of murderous bats, poisonous spiders, and of course, Drac himself. 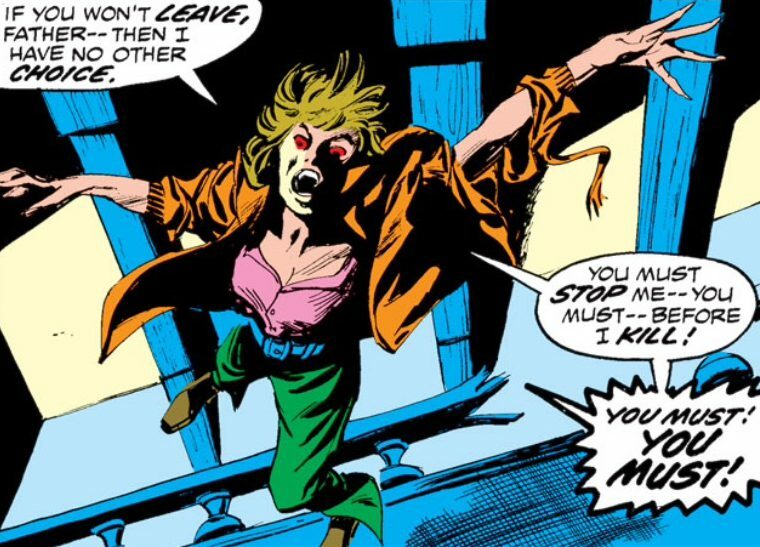 After a pitched battle with Blade, Dracula decides survival is the better part of valor and flies off into the night. Dark Victory: Taj finds Edith. The Good Guys have won, Edith is found, shaken, and the gang vow to stake the king of vamps once and for all. At least, that’s how the ending would go in a typical Marvel Comic. This was no typical Marvel comic. A lot had happened off-panel. Dracula could have killed Edith outright, but he did something far worse, something that would scar his hated foe’s soul forever. He turned her into a vampire. There really are no guidebooks for when your child comes out as one of the undead. Feeling the thirst for blood burning inside her, Edith begs for her father and friends to leave – and then, when they won’t, she begs them to stake her before she hurts anyone. They’re in shock. They can neither leave nor can they raise a hand to her. If lunch will not come to you, you go to it. To force them into action, Edith throws herself off the balcony. The impact stuns her. Quincy realizes he must act. He must do the unthinkable – he must stake his own daughter. Wait a minute. Edith never showed cleavage like this when she was human. This really is evil. Quincy ends the undead existence of his beloved daughter Edith. Gene Colan. What an eye, what an artist. It is impossible to imagine anyone else but Colan illustrating this series. 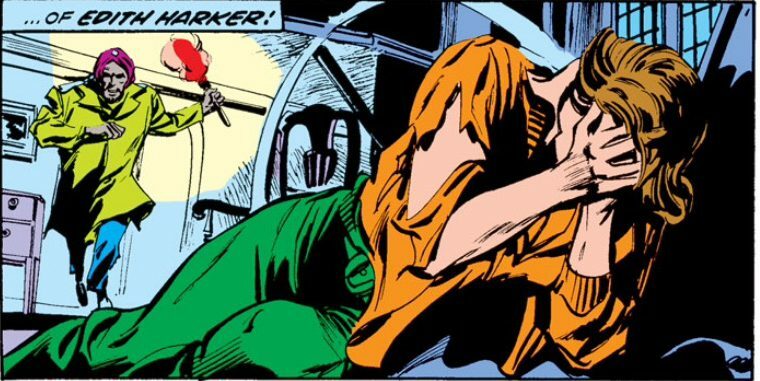 The collaboration between Wolfman and Colan would last until the series’ end, and their creative union stands as some of Marvel’s finest work. Even in defeat, Dracula has won. He claimed the most innocent among them. If he had slaughtered the slayers, so much the better for him. But here, he’s proven he can pick them off one at a time and force them to kill each other. That’s just a whole ‘nother level of villainy. In comparison, Dr. Doom might as well be Dr. Smith. Wolfman was throwing down his glove and putting readers on notice. In fighting this war, there would be casualties, there would be real suffering. 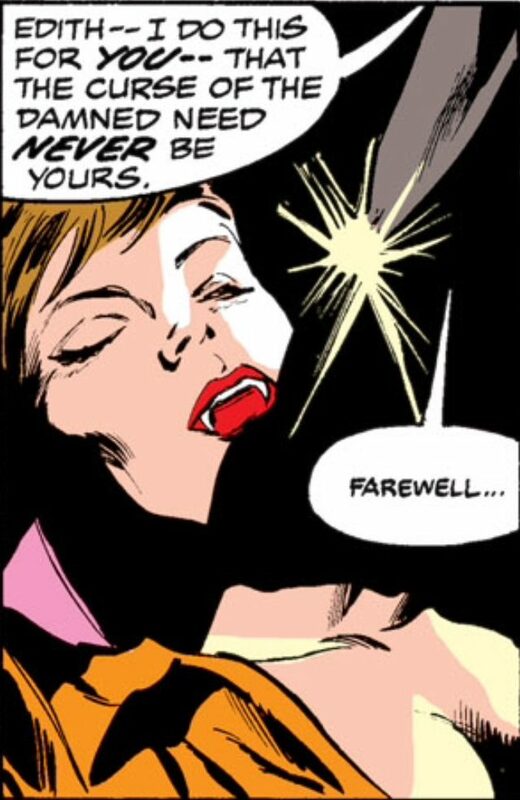 Somber lessons to learn and that’s why this issue of “Tomb of Dracula” remains one of my favorites all these years later. 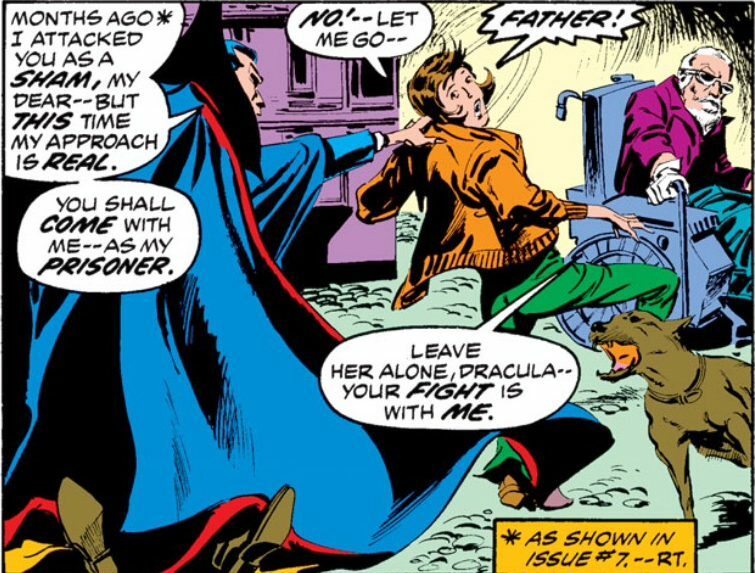 You can find this story in “Tomb of Dracula Omnibus Volume One” or in the Marvel Comics app – it’s one of the dozen or so issues Marvel has released digitally, and I wish the company would put the entire run online. It’s one of Marvel’s greatest series. Some titles do deserve a shot at eternity. 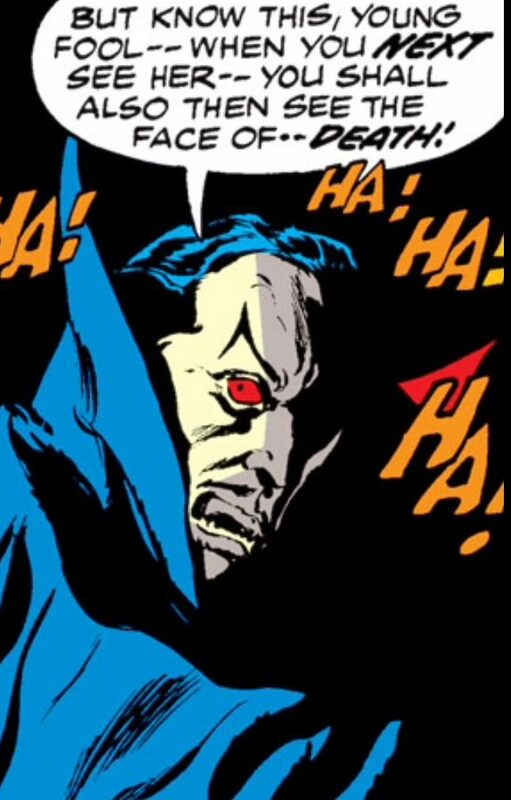 Dracula just has to get the last word in. I trust your new condo is no Whispering Hell or Screaming House. Actually, Brian, I’m discovering it’s something far worse … The Hovel of Clogged Toilets – based on the unpublished work by Bram Stoker.